This week we’ve made lots of progress on two fronts: the Jedediah Pants are graded and the first sample using the final pattern is complete! AND Matt and I finally completed the sewing room makeover that I’ve been day dreaming about! First, I’ll show you the room make over as this was completed earlier in the week (and, as you can see from the ‘before’ photos, was a necessary preparatory step to complete the Jedediah pants). Over the course of the last two weeks of my fashion design program my sewing space became a dumping grounds for anything to do with my end of year fashion line. 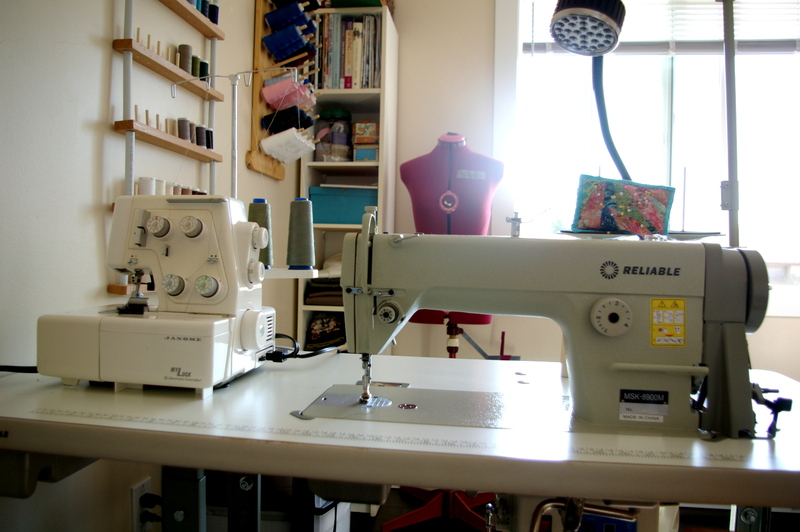 I started to do all my sewing at school (on a fairly ancient industrial machine) rather than using my nice new machine simply because there was so little room to work. 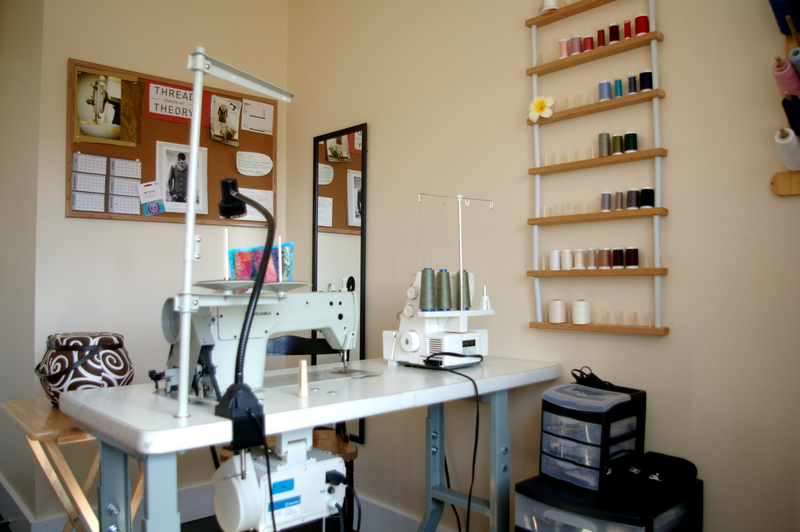 The view from my sewing chair – much nicer than looking at a wall! Once school finished up, the first thing on my to do list was to unearth my sewing supplies and make the half-room into a more use-able space. As you might be able to tell from the photos, my roommate kindly agreed to switch sides of the room with me so that I could have room to turn my machine perpendicular from the wall. This was the single most important change to the sewing room as it instantly made me feel less cramped and claustrophobic at my machine. While sewing the Jedediah Pants after this change being in the ‘open air’ instead of crammed against the wall made it easier for me to focus and stay patient while sewing. I also bought a small book shelf (the tall and skinny white one pictured) for $10 off of Craigslist to hold my fabric, Burda Style and Threads magazines and the rest of my sewing library. When I bought the shelf it was covered in crayon marks and sticky hand prints but these cleaned up considerably with the help of a Mr. Clean Magic Eraser. I like that the shelf gives me storage space but is small enough that my fabric has no choice but to stay folded and in order. My super sharp scissors hanging from the hook Matt installed for this exact purpose. For my birthday I got some amazing new sewing treasures which I have yet to share. Firstly, my parents gave me the most amazing scissors I’ve ever laid my hands on. It is actually quite scary grading seam allowances with them because they are so sharp and smooth I am sure I wouldn’t notice if I cut into several extra layers of the garment by accident! 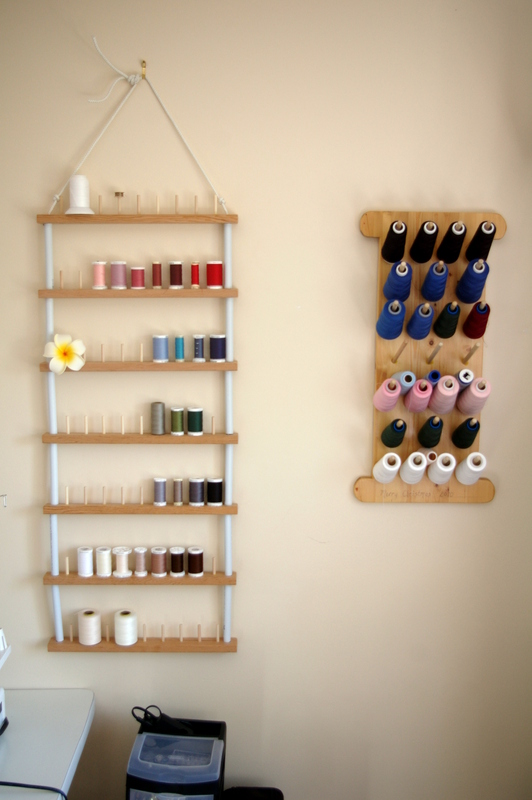 Also, my mother in father in-law have offered to make me custom sewing shelving (exciting!!!) since they knew I had my eye on the Ikea Expedit shelves. I’m really thrilled about this as I am hoping to design cubbies that will fit my serger and domestic machine (the Ikea Expedit cubbies are too small to do this). I also think it might be neat to have the top surface of the shelving as a multi-purpose area. It could have a removable ironing surface on it, a desk surface and also be able to hold another unit on top of it if I want to expand on the shelving in the future. I’m going to wait to come up with my final design for Rick and Sue as Matt and I will be moving the Thread Theory studio shortly and I want to make sure the unit fits in the new space. My massive thread organizers made by my Dad – they’re actually starting to fill up! The quilted pin cushion that my husband’s Grandma, a very skilled quilter, made for me. It’s filled with glass beads so it’s nice and heavy and stays in place on my sewing machine’s thread holder. In the background of this photo is the Thread Theory bulletin board I made to keep To Do Lists organized and to keep Matt and I inspired and on track. 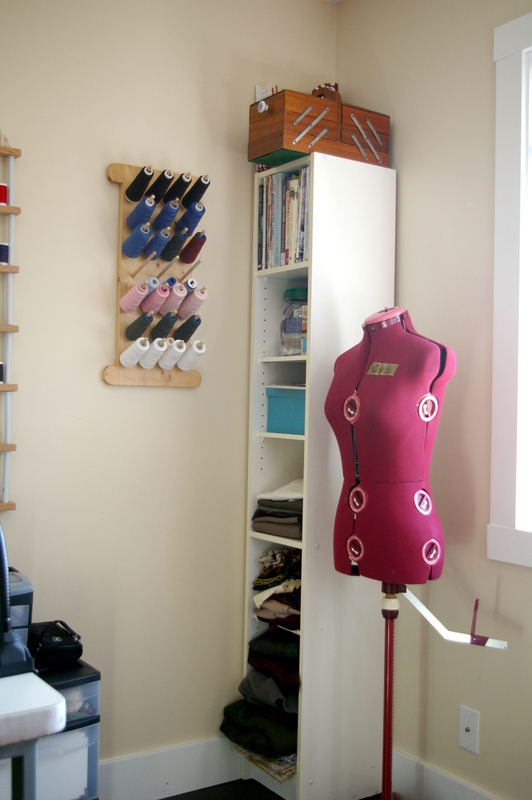 With my sewing room now in a usable (and inspiring!) state, I jumped into sewing up the freshly graded Jedediah Pants in a size 30, the smallest size we are offering. The pants are a slim-fit chino inspired trouser with big slash pockets on the front and easy-to-sew patch pockets on the rear. After sewing up the full length option I am really excited to try making shorts as I think the leg width in the upper leg area will be really conducive to creating comfortable but stylish slightly above the knee shorts. The fit is on the smaller side for these pants, similar to what sewers have noticed for sizing with the Newcastle Cardigan (an athletic sizing chart). For instance, Matt usually prefers a store bought pant in size 29 but often settles for a 30 due to lack of availability in smaller sizes. The size 30 of the Jedediah pant fit him perfectly on the waist and were an inch too long in leg length. I’m currently finalizing the sewing instructions and will be sending out the pattern to test sewers within the next week (FINALLY!). We are so excited to make the Jedediah Pants available for sale as Matt and I think that his pants pattern is the perfect modern fitting base for endless menswear pants variations. Simply changing the lower leg width could create everything from skinny jeans to a wider casual trouser. I can imagine these sewn up in everything from denim to a dressy wool blend and am looking forward to sourcing some bright summer cotton twills for shorts. My Dad suggested I try adding metal rivets to a heavier duty pair of Jedediah pants for a really professional finish – a detail I am eager to try out after using them on the leather purse I made for my line. They are so easy to tap in with a hammer and have a big effect on overall appearance and strength. Categories: Friday Posts, Jedediah pants | Tags: make-over, sewing room | Permalink. I love these! Can’t wait for the pattern to come out. And if you’re ever looking for testers, please keep me in mind. I really enjoy testing patterns! Great 🙂 You’ll receive our email with pattern testing details shortly! Exciting! Haven’t made and menswear yet, I think my boyfriend’s going to start pestering me before long. Love the fit and the pockets, these look so classy! Nice pants! I’ll make a pair for my boyfriend. Do you still need pattern testers? Hi, I just wanted to let you know how great I think your patterns look! And I am very excited about the Jebediah pants for my nearly-husband! 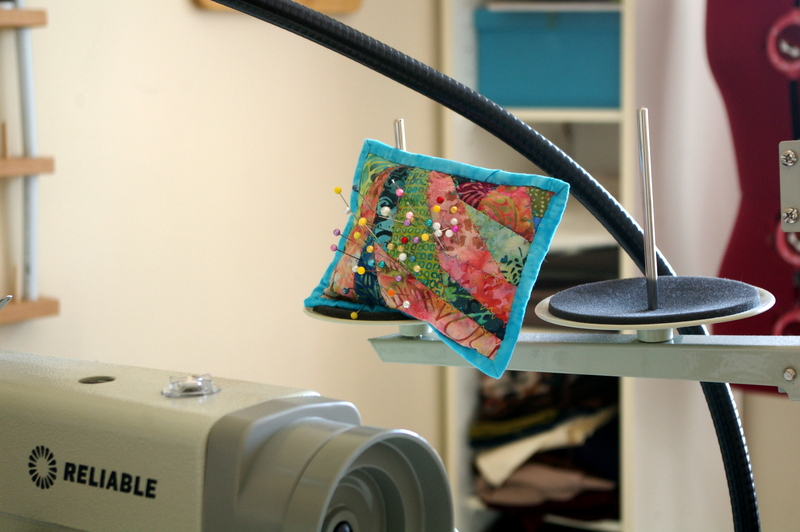 I’m so excited I’ve just written a post about Thread Theory on my little blog! Am now following you to keep updated on the pattern release. Congratulations! These are great. Finally a slim modern style pant for men. My boyf will love these! Can’t wait for the release. I recently found your site. Fabulous stuff. Great to see something getting made for all the skinny guys in our lives. I’ll be following you. I’m just going to echo the other commenters and say that I love all the stuff your family made you and I will probably make a pair of the pants for my husband. Your sewing room and pants both look great! love the sewing room, and these pants look great! can’t wait to try them out on my husband! I really need to clean up my sewing room and you’ve got great organizing ideas! 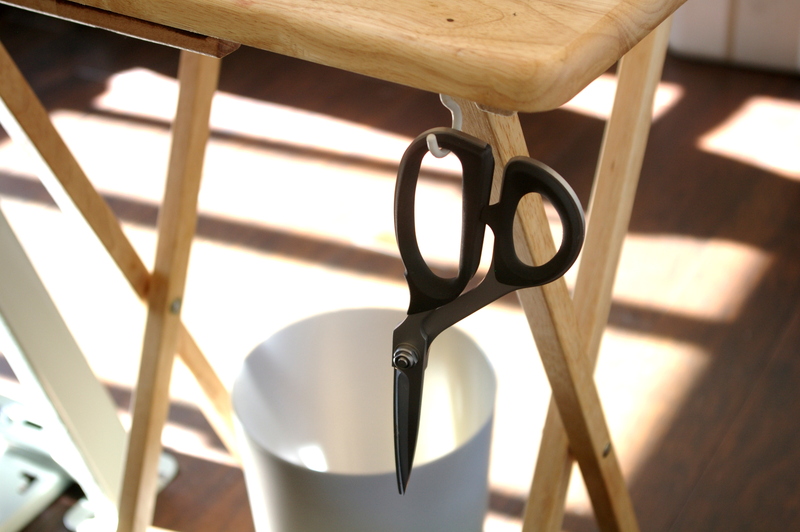 The scissors hook is brilliant – I’m always walking around trying to find out where mine are (usually under a piece of fabric). My husband is between RTW pant sizes so I can’t wait for the Jedediah pattern. I hope the scissors hook solves that problem for you 🙂 I still forget to put mine on the hook now and the point is so sharp on my new ones that I really better learn quickly! Yes, I feel so lucky to have such support! I will add you to our pattern testing list – we’ll be sending out the email with the testing time frame shortly! They look amazing! My boyfriend would love these. I’ll buy them!